Wow – so a few weeks back I was contacted by Katya Korableva a journalist working for the Russian arts-education magazine Theory & Practice to talk about my dissertation in comics. The interview with images of the work now appears on their site – entirely in Russian! Please see here for the interview with images. Katya asked some really thought provoking questions that made me have to think deeply about what I’m up to, and I’m grateful for the opportunity to share with T&P. For those of you who can’t read Russian, I’ve posted to text of the interview below. At the close of that interview, I posed a question about comics education projects going on in Russia. For any Russian readers coming here – I’d love to hear what’s going on. Probably the first question is the hardest, but I dare to ask: how is your dissertation going? What are you drawing and writing right now? Can you tell us already, when it will be published? Good question! I’m pleased with how it’s coming along. It’s a slow process, but I feel each page is worth the time it takes. I’m in the middle of the second chapter, which is a discussion of interdisciplinarity through the metaphor of how we see, and I just finished a sequence spanning from the Copernican Revolution to the Enlightenment. These particular pages weren’t in my original outline, but they emerged organically in the process of making. I expect to have the entire work completed and defend in spring of 2013. Your dissertation illustrates beautifully a melting of science and art. Do you hope that it becomes a new standard for theses? Thank you. I do hope that it helps open doors within the academic community for other visual-verbal scholarly works, as well as other forms already in existence or still-to-be-imagined. But I don’t see this as becoming the new standard. Rather, I hope it contributes to raising the question of what “standard” means, and providing an example that others will take up in their own way, by their own means of working. Did you have to fight for the approval process? Actually, no. I came to Columbia with the idea that I would do something like this. Back in Detroit, I had made a comic book about the history, meaning, and philosophy of games in conjunction with an art exhibition we organized there. 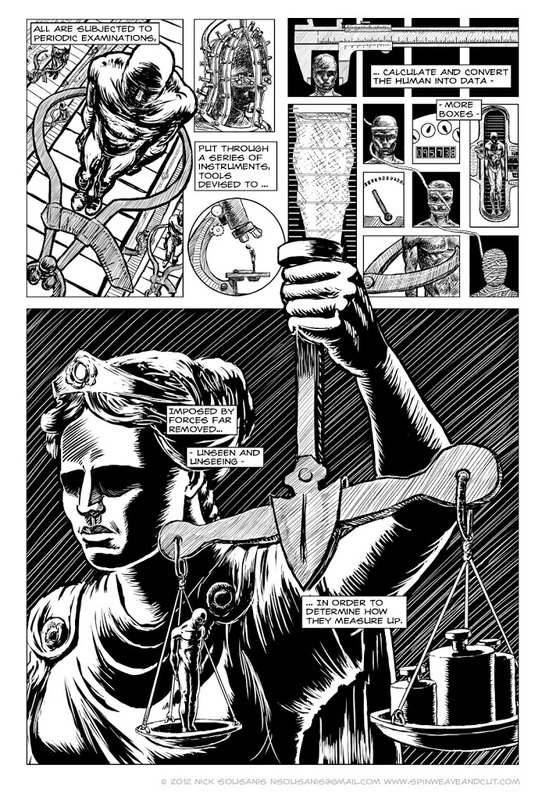 I shared this work with professors here when I was applying as a demonstration of the potential for how comics could present complex ideas in an educational manner. It was received positively, and once I got here, I began making comics for my assignments. In fact, my primary advisor, Dr. Ruth Vinz invited me to make a comic as the final chapter of her recent book On Narrative Inquiry. I think as with graduate students, professors too, are hungry to see something different in the academic realm and they’ve demonstrated strong support in believing that this should happen. Could you also imagine writing your dissertation in a more convenient way? Ha! Sure, I like to write, I like to play with words, and I spent a lot of years writing thousands of words per week as an arts writer back in Detroit. Writing this would definitely take less time – but I find that I’m able to achieve something more whole in my thinking when I draw and write together, and I’m thrilled to be engaged in that process. I think it leads me to discoveries that I wouldn’t come upon using text alone – which is an integral part of my argument. There have been plenty of things written about the importance of visual thinking, but I believe we need to “walk that talk” and actively engage in the making. To be true to what I’m proposing, I think it’s necessary to say it in image. Sorry, I know that everybody asks it, but when you get the idea, do images or words come first? My playful but absolutely true answer to this is always: “Yes.” I can’t speak for other comics authors, but in my case, I begin with some notion of what I want to express and then I start to sketch out ideas in image form and text. As I play with these very loose ideas across the space of the paper, I start to make connections, draw associations between images, between text and image, and that leads to new elements being added to the mix. As this continues, the idea starts to take shape more fully. Even when I have a rough script and fairly detailed layout, I find that the text keeps pushing me to reconsider images and what I’m drawing asks me to alter the text. It’s a constant back and forth, right up until it reaches some balance that satisfies my initial ethereal idea – often in a way I hadn’t expected. A lot of people have difficulties producing a huge content. What helps you to stay inspired? For me, this is about a desire to see the ideas realized for myself and to share them with others. I enjoy asking questions and exploring possibilities, and I find it’s not until I’ve created the piece that I really understand things. Even when I’ve laid out the piece (which I have done with the dissertation), there are still surprises on every page along the way. It’s not really a matter of filling in the details after the outline is there, but a process of ongoing discovery that the work takes me on – and I am excited to make that journey. Could you tell us about a course you are teaching? How many students do you have? What are your methods of teaching? I teach a course for educators here at Teachers College, Columbia University on understanding, making, and teaching comics. Most of my students are or will be teachers in elementary and high school. So far, classes have been small enough to have a lot of interaction between everyone but big enough to have a diversity in our work and discussions. Although nearly all of the students in the class enter as self-described as non-drawers and definitely non-comics makers, I have them make comics from the first day onward. I strongly believe that we learn theory best through practice, through the act of doing and making – and I see this demonstrated with every piece they create. I offer them a simple comic prompt that they work on to share in the next class. We are then able to discuss the pieces as a group, consider why they made the choices they did and so forth. It’s a cyclical thing – we look at example works and break down theoretical elements of how they work and then do the same in our own works, which backs up the theories and propels students to explore more ideas when they’re making works. I have been consistently amazed by the compositions students (regardless of previous drawing skills) come up with that beautifully demonstrate how comics work at a fundamental level. Ultimately, the course builds to them thinking on ways they’ll incorporate comics (or other aspects of visual thinking) within their own educational setting and often some are putting these ideas into practice even as our course is going on. What books do you recommend to your students? Scott McCloud’s Understanding Comics is an absolute must. 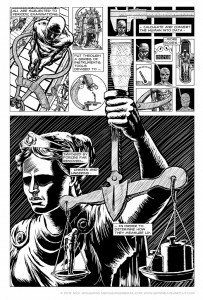 McCloud wonderfully demonstrates the ways that comics make meaning within the medium itself. Its release in 1993 opened the door to comics being integrated into school curriculums – through librarians and adventurous teachers. Obviously too, Understanding Comics paved the way for the kind of work I’m doing – for which I’m ever grateful. The book offers terrific insights into how to think about the workings of comics, and a great starting point to start to break down and articulate what’s happening when you read a comic. Can’t recommend it enough. Jessica Abel and Matt Madden’s Drawing Words & Writing Pictures and recent sequel are excellent textbooks for teachers and those interested in learning the craft of comics-making from two pre-eminent thinkers in comics. Extremely useful books, especially if one is interested in making comics. Also from Matt Madden is an amazing book called 99 Ways to Tell a Story, in which he tells the same intentionally mundane one-page tale 99 different ways – experimenting with form, style, genre, and more. It’s a terrific way to think about comics-making from practice-based means. In class, I always share excerpts from Alan Moore’s comics, particularly Watchmen with Dave Gibbons. Moore and the artists he’s worked with are such masters of the possibilities for the medium – in terms of ways the visual and verbal can interact, in interweaving parallel stories within the same space, and much more. It’s wonderful to think through comics theory by looking at these examples. Alongside this, we look at comics theory in text by such scholars as Thierry Groensteen, R.C. Harvey, and others – each one providing different access points from which to consider comics. In a related vein, Chris Ware’s comics showcase the wide-open possibilities the comics medium has for expression that make it quite distinct from text and film. David Mazzucchelli’s book Asterios Polyp besides being an all-around beautiful book, speaks to notions of multimodality that are being considered more prominently in education today. Terrific examples of the use of color, shape, font, and other tools to layer meaning. I could go on with examples that we draw from, and that list is continually growing as I come across new works all the time. In one of your interviews you said, that „Comics force you to leave out a lot and preserve empty spaces; for me at least, it’s like having a built in editor“. It seems that nowadays the skills of editing are becoming more and more important. Do you have any advice, how the one could develop in himself this „built in editor“? You never know when a previous response will come back to haunt you… J I don’t think I can speak generally to how someone can create their own built-in editor, but I can address how my particular process shapes my work. In his book The Grasshopper, Bernard Suits’s defines playing a game as “a voluntary attempt to overcome unnecessary obstacles. ” I’m quite interested in the idea of how formal constraints, rather than being a limitation, actually stimulate unexpected discoveries. 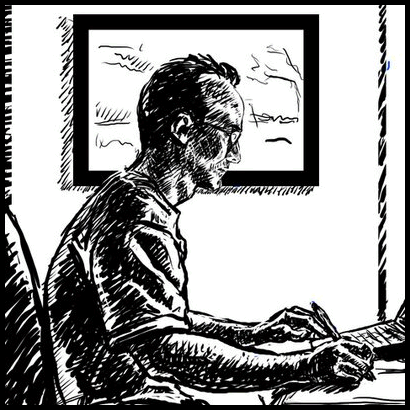 In making a comic, I’ve agreed to adhere to certain “rules” – the size of the page, page count, and other things – and within that constrained space, I play a game where the shape of the piece itself shapes the content. It’s a generative conversation between my initial notion and chosen constraints, which frequently gives rise to something unexpected. “Built in editor” is also applicable in a more mundane way, that is, I keep trimming words to leave more room for the images and what emerges through this play, I find to be much more powerful than had I gone on and on about it (like I’m doing here!). In that interview, you also mentioned, that once you got into trouble for drawing on the margins of your notebook during class. I think a lot of teachers really take this activity to heart. How would you react on it if you were a teacher at school? I’d like to think I’d encourage it. It certainly happens in my comics class – and I encourage it there. I know for me, drawing was a way of paying more attention, and I’ve heard that from other artist folks. I guess if you create a classroom environment of respect – drawing that needs to happen, happens, and things that are out of bounds – typically don’t. How often do you see that some people still do not take comics seriously and think they are only entertaining? What is the best way trying to change their opinion? Do you think that comics as educational medium are good for people of all ages? Are there any projects of bringing more comics to primary and secondary schools? Absolutely, there are great examples out there of topics like illness narratives, gender, history, and more being taught through comics in the university. As more people open up to using them, there are more works for them to get their hands on. And as the medium is more accepted, authors continually push on borders, exploring new approaches and new types of material to express through comics. It’s an exciting time and feels like it’s only getting better. My sense is there are countless initiatives for integrating comics into classrooms being implemented and new ones popping up all the time. A few examples that I’m familiar with include the long-running literacy-through-comics initiative The Comic Book Project, started by Dr. Michael Bitz while a student here at Teachers College and more recent efforts like Denver’s Comic Book Classroom (http://www.comicbookclassroom.org/). We see educators sharing resources on using comics with their students in online ventures like the “Making Curriculum Pop” ning organized by Ryan Goble (www.mcpopmb.ning.com), the first-hand experience of Maureen Bakis in her book The Graphic Novel Classroom, and more. Textbook initiatives are on the rise as well, from the adaptation of Bill Ayers’s To Teach in comics form to the Reading with Pictures graphic textbook, the Graphic Canon, and on and on. Could you describe some projects you are currently working on? Dissertation. That is all! Really, until this is finished and out the door, I need to stay focused on this and do my best to turn down other projects. I have a number of things on the docket for when I get done, but now it’s dissertation, dissertation, dissertation, a few conferences to talk about the dissertation – and then back to the drawing board again! Nick, Thank you very very much for taking your time! Thank you, Kate, for the opportunity to think through ideas and share a bit of where I’m coming from with your readers. If I may ask one question back to you and your readers – I’d be really interested to learn about comics-education projects going on in Russia?